Tyr is a unique legendary Crusader creature card. It is part of the Core Set. 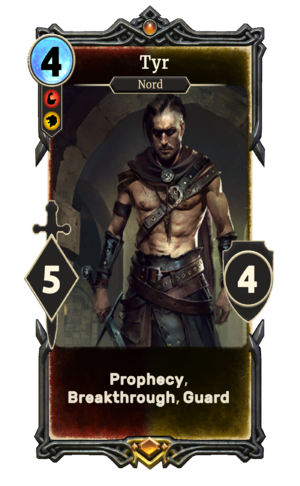 In addition to the card's availability in the Core Set, one copy is obtainable in the Band of Survivors deck as a potential reward from Interlude. "Here we make our stand." "It's time for some fun." "Time to split some skulls." This page was last modified on 16 February 2019, at 15:34.